Divein Open-Cell / Smoothskin wetsuits are an extraordinary product! Offering unmatched comfort, elasticity and warmth, Divein wetsuits are the wetsuit of choice among the world’s top freediving athletes and professional spearfishermen. 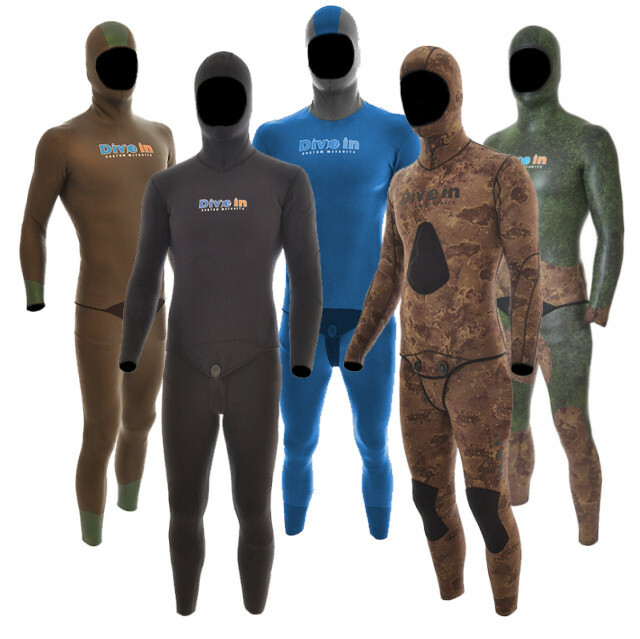 Nevertheless, these unique properties come with a price – unlined (smoothskin / superskin / open-cell) wetsuits are very delicate and fragile and must be used correctly in order to prevent damage to the wetsuit and ensure that it stays in great condition for a long time. 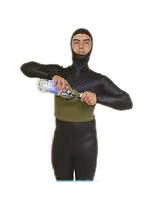 • Always use lubrication when putting on your wetsuit. Use water mixed with plenty of soap / shampoo / conditioner. • Never pull on your wetsuit with your fingernails, always use an open palm to slide the wetsuit over your body. Use additional lubrication if necessary. 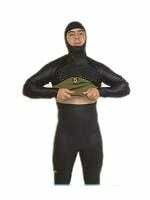 • Never apply pressure to a single area of the wetsuit. • Use plenty of water when taking off your wetsuit. Use additional lubrication if necessary. • Never leave your wetsuit in direct sunlight in order to avoid damaging the external wetsuit coating. • Always rinse your wetsuit in fresh water after use. If you have a lined wetsuit, soak it in water with softener for a few hours every once in a while. • Use only the correct method of putting the wetsuit on and taking it off as described in the guide below. Divein emphasizes that unlined wetsuits are supplied as is, without manufacturer warranty, as they are very delicate and fragile in nature. 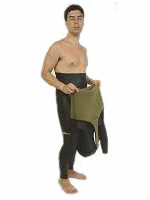 Therefore, proper handling of your wetsuit is paramount in order to keep it in good condition for a long time. It appears that many divers don’t know how to put on and take off their zipless freediving / spearfishing wetsuit properly. 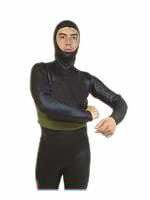 The most common mistake is attempting to put on the wetsuit jacket by getting both hands in first and then, with a single rotating motion, the head. This method is extremely harmful to your wetsuit as it overstretches the wetsuit neck area and puts an enormous stress on the underarm seams. This is true for single lined wetsuits and even more so for unlined wetsuits, where glued areas may become undone or actually tear as a result of the excessive stress. In lined wetsuits this method causes a widening of the stitching holes and water infiltration as a result, this kind of damage is mostly irreparable and is not covered under manufacturer warranty. 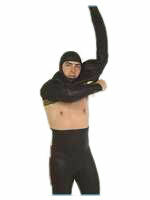 An equally common mistake is attempting to take off the wetsuit jacket by pulling the beaver tail. This method for taking the wetsuit off causes a great deal of stress to the wetsuit material and seams as well. The following guide will demonstrate the correct way of putting on and taking off the wetsuit jacket without causing damage to the wetsuit. Always use these methods when wearing your wetsuit in order to keep it in good condition. 1. Lubricate the inside of your wetsuit with water mixed with soap / shampoo / conditioner and fold the wetsuit jacket in the middle. 2. Slip your head in. 3. When the hood is in place, slip one of your arms in. 4. Now, with the arm already inside the wetsuit, hold and lift the opposite side of the wetsuit in order to allow your other arm in. 5. This is the point where most divers get stuck and give up. 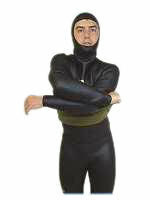 Instinctively, most divers will pull the wetsuit down, making it impossible for the other arm to slip in. The trick is the overcome this instinct and actually pull the wetsuit up. 6. Next, slip your other arm in. 7. Gently unroll the jacket down to your waist. 8. And you are done! 9. 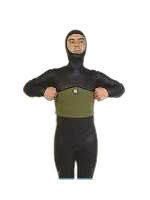 Give a good blow into both of your wetsuit cuffs and the wetsuit will align perfectly with your body. 1. First, fold the wetsuit jacket up to your chest. 2. Pour some water into the formed pocket (this is especially important for unlined wetsuits). 3. Use one of your arms to grab at the edge of the jacket as far back as possible. 4. Slip your other arm underneath the first arm until your shoulder is close to the first arm. 5. With the aid of your shoulder, raise the first arm up and, while grabbing the edge of the jacket with both hands, pull upwards in a swift and continuous motion. 6. Continue pulling upwards in a swift and continuous motion. 7. And you are done!